Firstly, I apologise for the dodgy photos in this post; my camera’s battery had run out and I used my phone, which isn’t great for indoor photos. Secondly, have I mentioned how spoilt we are for salmon in the Pacific Northwest? It’s crazy good. In Melbourne, you’re lucky to get lightly ripped off when you buy Atlantic salmon, which is really just farmed salmon that’s never even sniffed the Atlantic Ocean… side note to any ichthyologists out there, can fish smell? In Seattle, Atlantic doesn’t even factor into our choice of salmon, it’s the bottom of the barrel. At your local supermarket you can get whole Chinook, Coho and Sockeye (my personal fav) when they’re in season for about a third of what we pay for Atlantic back home; when they’re out of season, they’re still only about half the price. There are more varieties, of course, if you go to specialty fish markets. Guess what July is? The middle of Sockeye salmon season. The green tips of leek are low FODMAP. 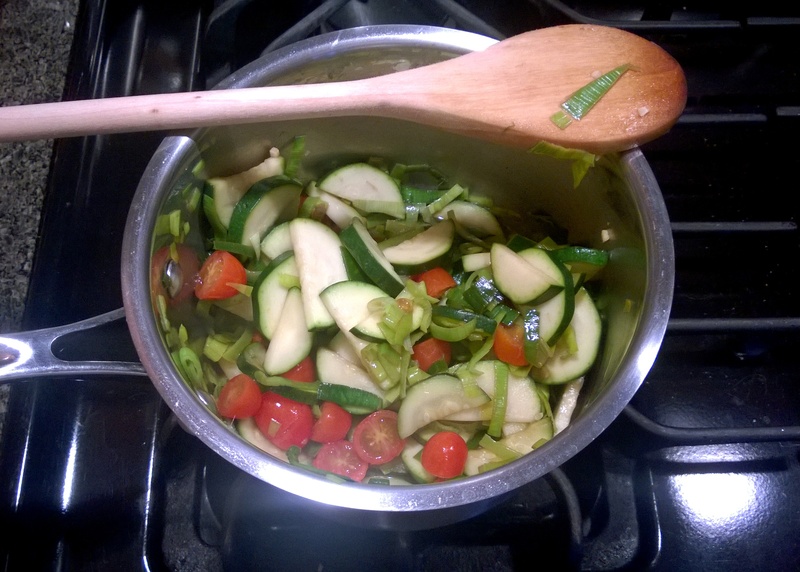 Zucchini is low FODMAP in servings of 1/2 cup. Cherry tomatoes are low FODMAP in servings of 1/2 cup. Mushrooms contain mannitol, so if you malabsorb mannitol then swap them out for more zucchini. Spinach is low FODMAP in servings of 1 cup. Lemon, ginger and soy sauce are all low FODMAP. Use gluten free soy sauce if you are a coeliac/sensitive to gluten. Seal your pan with the olive oil and pan fry the salmon fillets over a med-high heat; it should take about 4 minutes on the first side and 2 minutes on the second, though this will depend on the thickness of the fillets. Once for each side, drizzle with the “little bit” of lemon juice from the second half of the lemon. Meanwhile, lay out washed baby spinach on a serving dish. Saute the leek tips, zucchini, cherry toms and button mushrooms in the garlic infused olive oil until tender (not over cooked) and remove from the heat. By this time, the salmon should almost be done. 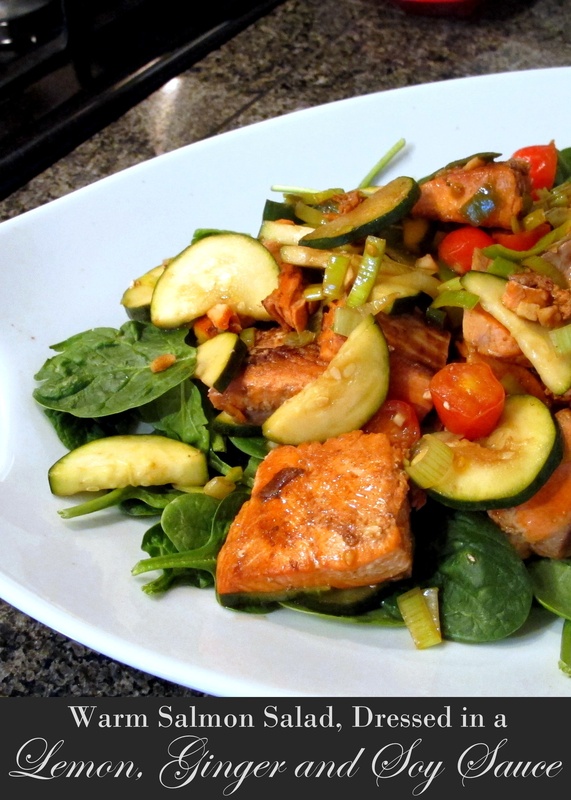 Turn down the heat to low and cut the salmon into bite-sized chunks and stir through the sauce ingredients. Once the sizzling has stopped, stir through the sauteed veggies. 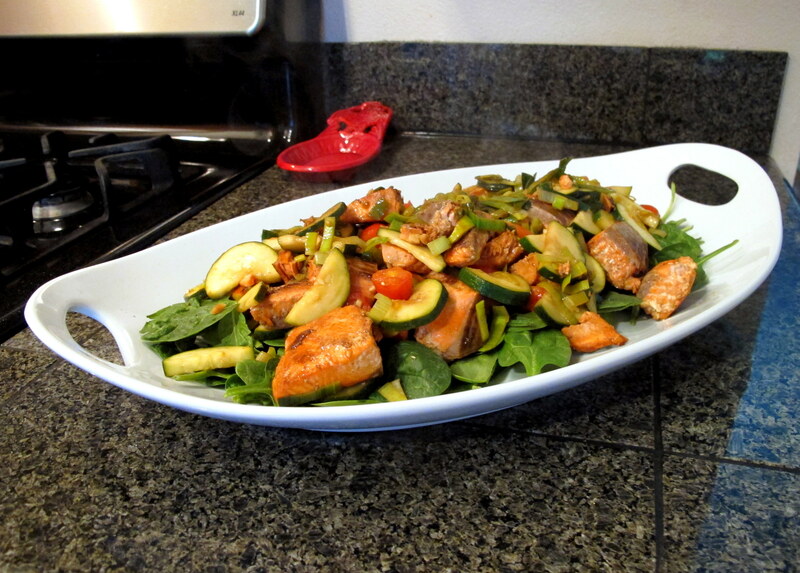 Layer the warm salmon and veggies over a bed of fresh baby spinach (you could wilt the spinach if you like but I prefer it fresh) and serve with white rice. 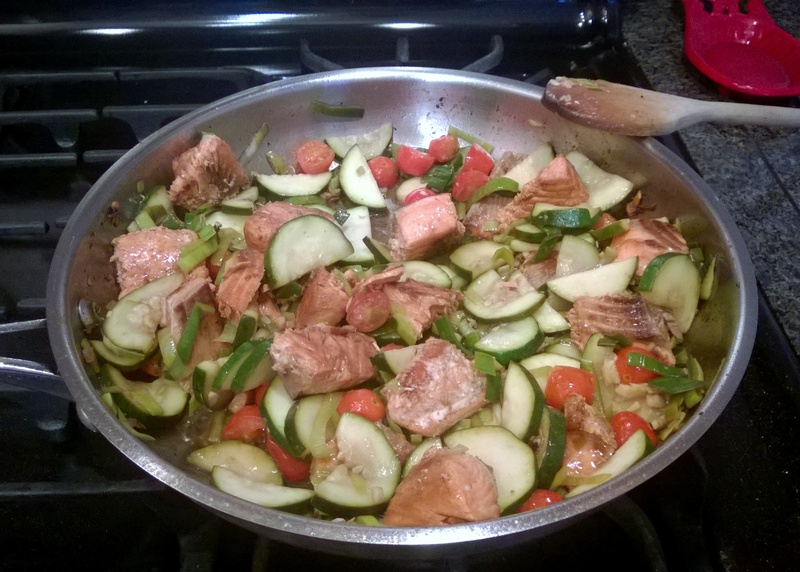 The white rice takes 30 minutes to cook (without a rice cooker, I couldn’t tell you how long it would take with one), so make sure you get it going before you start cooking the salmon and veggies, as they only take 10 minutes once they’re on the heat. Oh and the most important part – enjoy! This entry was posted in Carnivore, Dinner / Mains, Entrees, Appetisers and Sides, Salads, Seafood Entrees or Sides, Seafood Mains and tagged Aussie, Australia, dinner, entree, fish, FODMAP, FODMAPS, fructose friendly, fructose malabsorption, ginger, gluten free, healthy, home-cooked, homemade, lemon, Pacific Northwest, PNW, salmon, seafood, Seattle, sockeye, sockeye salmon, soy sauce, USA. Bookmark the permalink. ← What does an Aussie take to a 4th of July BBQ?